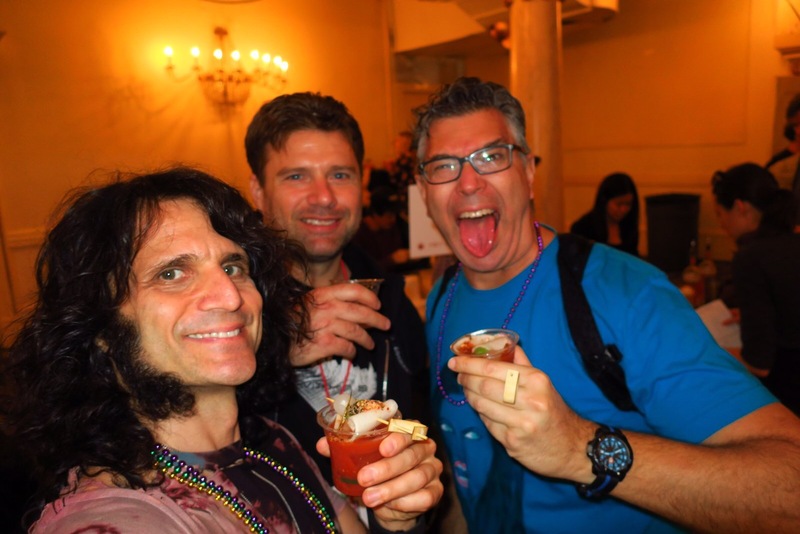 The forth annual BloodymaryFest was another hit, once again held at the Brooklyn Opera House. A great spot indoors and out with 60+ sunny weather made this place perfect for the event. Marz Vodka provided the proverbial fuel to the fire so to speak. Contestants need three things to win this event. A superior Bloody Mary mix that could be traditional or eclectic. Balance is key. Bringing enough of both. I say this because it happened last year and it happened again this year where a contestant ran out halfway. This is a 3 hour event, a marathon not a sprint. I started at Catfish’s table and worked my way around hitting a number of them more than once. A&E supply – Normally I can’t stand Kombucha…but it actually worked here making a tasty and different Bloody topped with homemade pickles. Travel Bar- They get creative adding Cucumber juice and Banana Pepper juice to a classic mix. I’m a big fan and pretty sure I picked them as my fave last year. Lobster Joint– They had lines the whole time. People see Lobster they go nuts. Thing is, what this turned out to be was a pitch perfect Bloody Mary with a creative and colorful garnish. I love B-Mary’s but after a number of them my taste buds needed a break. Coole Swan Irish White Chocolate liquor did the trick. If you’re an Irish Creme fan check this stuff out. Cheese from Cypress Grove Chèvre and some Bacon Spread from Bespoke Bacon got me back in the game. Insa -Wasabi and Kimchi gave this Bloody an Asian spin. The crowd was mixed on this one. They either loved it…or not. I loved it and the great daikon garnish. I gave them my vote for being very good and different. Skylark – They added some brines, hot peppers and Guinness which did work and I liked it. Though I would have liked to have tried it w/o the Guinness. Citrico served Michelada’s, I love this Mexican Beer Cocktail. Instead of a traditional Cerveza they used Tsingtao which worked. K Bloody Mary mix – A very good well balanced pre-made mix. Just add Vodka and get creative with your garnish. Toma Artisinal – this was both very tasty and different being based on tomatillo’s vs tomatoes…I just wish it were green. Cocktail Crate – these are tasty pre-made Cocktail mixes. I tried the Grapefruit Daiquiri and the Sriracha Margarita. They were both balanced, not too sweet with the former a bit tart and the latter having a hint of heat. In the end The Lobster Joint won first place and deservingly so. Competition was once again great with competing Bars putting forth a great mix of original variations on the classic. Kudos to Evan Weiss and his team for putting together another great event. For those of you who live in the NYC area the Baroness of Bloody Marys the DrunkenTomato has a Bloody Mary guide coming out in the the not too distant future. 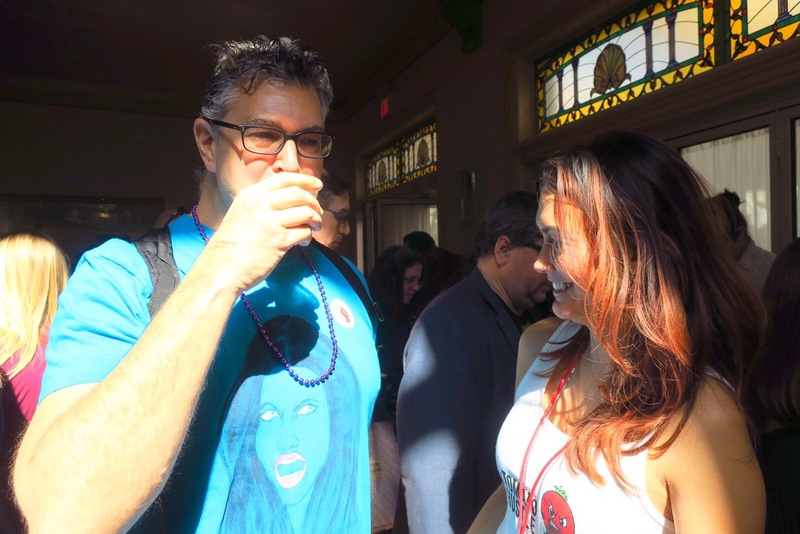 Well until next year…I’ll be posting up Bloody Mary brunches throughout the year. 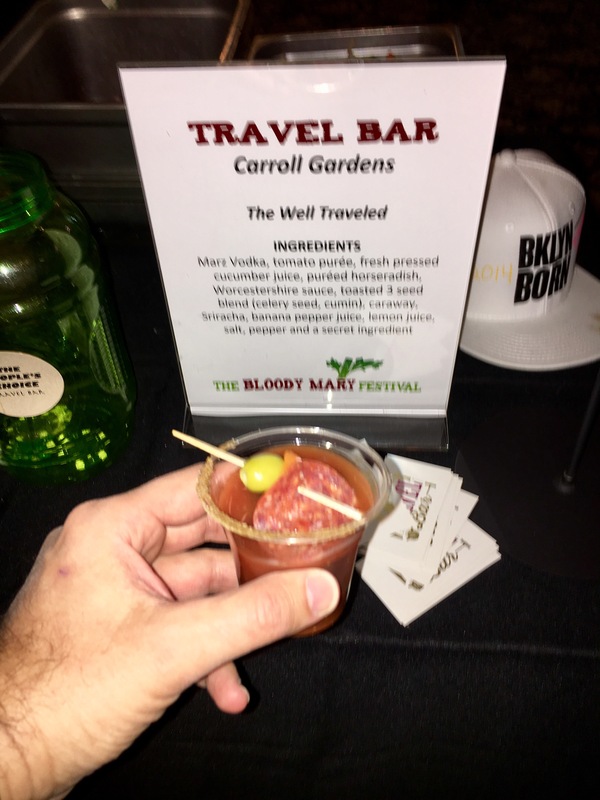 Posted by Hunter on April 17, 2017 in Beer, Bloody Mary's, Brooklyn, Cocktails, Coffee, Micheladas, Tasting Events and tagged @BloodyMaryFest, Bloody Mary, Bloody Mary's, Brooklyn, Cocktails.